Rainbow Ridge Resort cabin rentals are just minutes from Pigeon Forge Entertainment, shopping, and restaurants. We offer over 10 cabins and chalets ranging from 2 to 7 bedrooms in a quiet cabin rental community convenient to both Gatlinburg and The Great Smoky Mountains National Park. Our resort rental cabins feature game rooms with pool tables for continuing the family's evening hours fun or as a break from the outdoors on those very warm days. At Rainbow Ridge Resort you can easily access NASCAR Speed Park, Rain Forest Adventures and some of the best shopping in the Smoky Mountains at Tanger 5 Oaks Mall where there are dozens of the hottest outlet stores. Looking to take time out to play miniature golf, Old McDonald Golf is a fantastic course to play with the whole family. 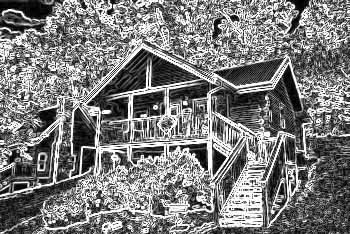 Don't forget, you receive immediate SAVINGS when you BOOK your Rainbow Ridge cabin rental ONLINE with Cabins USA!